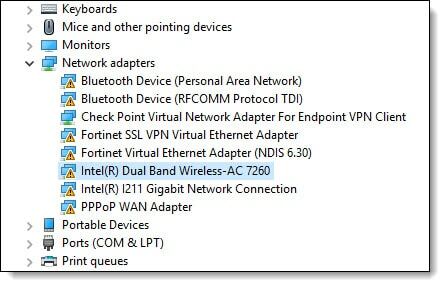 After installing the Windows 10 Fall Creators Update (Build 1709) on my PC, all my network connections–whether wired or wireless–were broken. When I checked the device manager I had an exclamation mark against all but one network device. 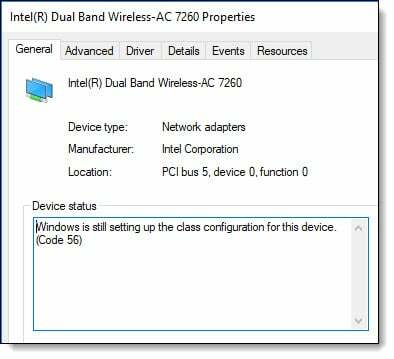 The only device excluded from error was the “Check Point Virtual Network Adapter”. Going into the properties of one of these devices gave equally cryptic errors. All devices reported the same thing. A couple extra reboots did not resolve the odd error either. A quick search on the internet revealed forum postings that identified the Check Point VPN as the culprit (credit SOHIC for the answer). This made sense as the version of the Check Point software I had made no mention that it was supported on Windows 10. My bad! But this was the key. When I uninstalled the software and rebooted, all my network connections came back to life. 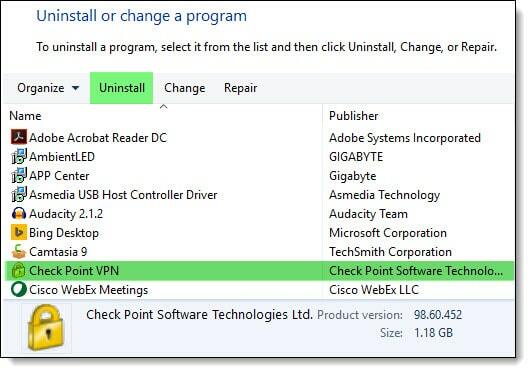 The process to uninstall the Check Point VPN is as simple as uninstalling any other software. To do this, click on your Start Menu and start typing “control panel”. Select Control Panel from the search results to launch the control panel. From the control panel click Programs and Features. Under the Uninstall or change a program dialog select Check Point VPN and click Uninstall. Click Yes when prompted to confirm the uninstall. This install should only take a few seconds. At the end of the install, you will be prompted to reboot. Save and close any work you have open. Click Yes to restart your machine. Otherwise, click No to restart later. Upon restart, your network connections should be restored. No Checkpoint VPN on the machine. Bought another USB network adapter, that one fails the same way. Strange enough, if I plug in both USB wifi adapters, the older one no longer shows an error icon. Main reason I was looking at USB adapters in the first place is the built-in wifi on the laptop won’t automatically connect unless you switch it off & on a couple times, and then do the same thing on the MSWin network settings. It’s set to automatically connect, but won’t do it. great! Problem is solved for me. I have the same problem though only affecting my Ethernet connection. WiFi is OK. I had never had a VPN and it did not start after a Windows update. Most of the suggested fixes seem way too complex for me. I hope one synthetic real cause and cure will emerge. Microsoft seems disinterested. I uninstalled all VPN software and I am still receiving the code 56 error. Any solutions ? I’m having the same exact problem, except I don’t have CheckPoint VPN; so, I can’t uninstall it. Additionally, I just purchased a new USB Wireless Adapter. After I loaded the drivers and rebooted the computer, the adapter showed…but with the same exact problem. I can’t get on the internet to do a Windows update so I’m stuck with a loptop that can’t get online. Hi, I was wondering if you ever got any answer to this question coz I’m in the same boat now and none of all the proposed solutions worked thus far. I have no CheckPoint VPN either, only the VPN settings that come with Windows 10 which I also tried turning off to no avail. My issue initially was that I thought my laptop was stuck in Airplane Mode, because I couldn’t disable it. So I checked the settings, and I realised my wireless capability completely disappeared – there was no WIFI option under Network and Internet Settings at all. I did restart several times, disabled/enabled the network adapter(which showed fine initially) more than twice and rebooted again; tried updating but obviously I had no internet connection (since ethernet connection is not possible for me at the moment). Finally, I uninstalled the wireless adapter and rebooted, hoping windows will automatically reinstall the device. But that was when I got the Code 56 error. I’ve scoured all forums but none helps. Your description seemed to be the one closest to mine so I was hoping you found a solution. Crossing my fingers. We have been having this issue, but even after uninstalling the VPN software and disabling the Symantec antivirus service, the devices still refuse to install properly. Great! That worked for me too.